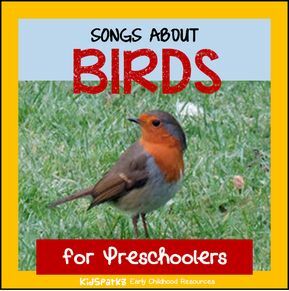 Here is a collection of the words for some songs and rhymes that coordinate with the popular early childhood theme "Birds", and can be used when planning activities and curriculum for young children. Found a feather, found a feather, found a feather on the ground. Picked up that pretty feather then I put it in my hat. I saw a little bird go hop, hop, hop. And she can't fly. Isn't that absurd? This is the way we scratch for worms. This is the way we peck for our food. This is the way we sit on our eggs. This is the way we flap our wings. Ten white seagulls just see them fly. Over the mountain, and up to the sky. Ten white seagulls crying aloud. Spread out their wings, and fly over a cloud. Ten white seagulls on a bright day. Pretty white seagulls, fly, fly away! And small bits of cake. There's a great big crocodile coming this way. Snip, snap, go his jaws. He is terrifying to see. But he'll never catch you! And he'll never catch me! And this baby robin decided to stay home! There's a little white duck, sitting in the water. A little white duck, doing what he ought a! he said, "I'm glad I'm a little white duck sitting in the water. A little green frog, doing what he ought a! "I'm glad I'm a little green frog swimming in the water. Who flies around in the dark of night? Who glides on wings o'er silent night? Who eats his dinner by late moonlight? It's a little hoot owl with his owl eyesight! Who-who, who-who, little hoot owl.